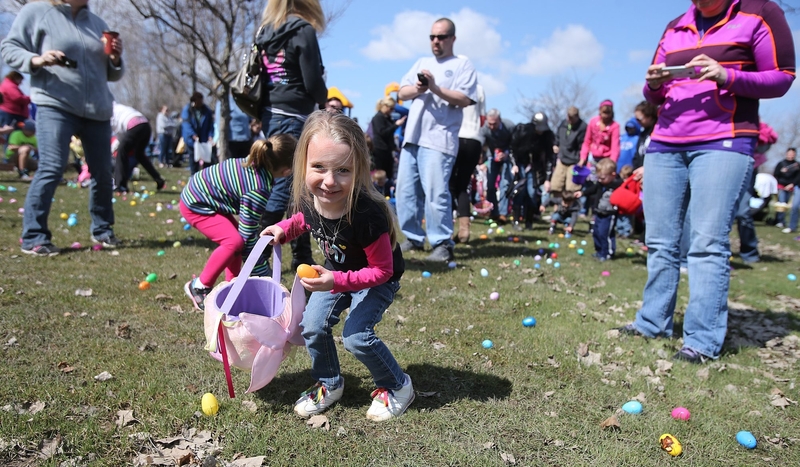 Tayen Perkins, 3, of West Seneca, gets ready to scoop up Easter eggs in Harlem Road Park in West Seneca on Saturday. It was a cool but brilliantly sunny day, perfect for discovering spring treasures. Dedication ceremonies for the Town of Newstead’s Cultural Center are scheduled for Thursday afternoon. Located in the basement of Newstead Public Library, 33 Main St., the center will be dedicated at 4 p.m. Thursday. The Town Hall will close at 3:45 to allow staff to attend. • The Newstead Planning Board will hold a work session at 7 p.m. Monday, followed by a regular meeting at 7:30, in Town Hall, 5 Clarence Center Road. • A work session of the Newstead Town Board begins at 7:30 p.m. Monday in Town Hall. • The Akron Village Board meets at 7:30 p.m. Monday in Village Hall, 21 Main St.
• An Akron School Board meeting begins at 7 p.m. Tuesday in room H190 at 47 Bloomingdale Ave.
• Town and village residents may drop off tires between 9 a.m. and noon Saturday at the Joint Municipal Facility, 12707 Clarence Center Road. Permits are available at the Town Hall for no charge. Up to six tires may be dropped off. A regular meeting of the Alden School Board begins at 7 p.m. Tuesday in the high school library, 13190 Park St.
• The Alden Village Board has a work session at 6:30 p.m. Thursday, followed by a regular meeting at 7:30, in Village Hall, 13336 Broadway. The award-winning a cappella group, the Friends of Harmony, will perform at 7 p.m. Wednesday in Williamsville Meeting House & Museum, 5658 Main St. Billed as “The Grooviest, Most Hip and Far Out Musical Review of those Spectacular Sixties Songs This Side of the Peace Bridge,” the concert is sponsored by the village’s Arts & Cultural Committee. It’s free and open to the public. • The Amherst Zoning Board of Appeals will meet at 7 p.m. Tuesday in the Municipal Building, 5583 Main St., Williamsville. • A meeting of the Amherst School Board begins at 7 p.m. Tuesday in the district office, 55 Kings Highway. • The Williamsville School Board is holding a special meeting at 7:30 a.m. Tuesday in the district office boardroom, 105 Casey Road, East Amherst, to vote on the BOCES budget and board elections. • People looking to improve their financial futures can learn basic saving and investment concepts from noon to 1:30 p.m. Thursday in the Center for Tomorrow on the University at Buffalo’s North Campus. The event – “Leveraging Time, the Power of Saving and Planning for the Future” – is geared specifically toward a non-financial audience. Presented by Gregg Fisher, founder and chief investment officer at Gerstein Fisher, it’s part of the next Smart Business Practices, hosted by the UB School of Management Alumni Association and co-sponsored by the UB Investment Club. Cost is $30 for alumni association members and $35 for all others. Online registration is required by Monday. Register at www.mgt.buffalo.edu/smartbusiness. For more information, call 645-3224. • The Village of Williamsville will hold an Earth Day-Arbor Day celebration from 11 a.m. to 2 p.m. Saturday at Island Park, located behind Village Hall on Main Street. The event will include children’s activities and a sapling giveaway. Participants are asked to drop off gently used shoes, which will be donated to Friends of the Night People. The annual spring Art Walk on Friday kicks off a weekend of events to celebrate spring and invite people to downtown East Aurora. The art walk will be held from 5 to 9 p.m. Friday, when visitors can explore 13 art galleries, shops and bistros that will feature exhibits, demonstrations and food. Learn how to make face cream with green tea at the Purr-Fect Tea shop and get free popcorn with a movie at the Aurora Theatre. Check www.ateastaurora.com for details about discounts throughout the village, and the full schedule for Saturday and Sunday. • The East Aurora Village Board meets at 7 p.m. Monday in Village Hall, 571 Main St.
• A special meeting of the East Aurora School Board begins at 7:30 a.m. Tuesday in the superintendent’s office in the Middle School/Main Street Building, 430 Main St. Votes will be cast on the BOCES budget and board elections. • The Aurora Town Board meets at 7 p.m. Tuesday for a work session at the Southside Municipal Building, 300 Gleed Ave. The need to bring Verizon FiOS television and Internet service to Buffalo will be discussed during a community meeting at 6:30 p.m. Tuesday in the West Side Community Center, 161 Vermont St.
State Sen. Tim Kennedy and Assemblyman Sean Ryan are hosting the meeting, which will focus on Verizon’s unwillingness to establish service in certain communities. • The Buffalo Brownfield Redevelopment Corporation and the Real Estate Committee of the Buffalo Urban Development Corp. will meet at noon Monday in the fourth-floor conference room at 95 Perry St.
• A Planning Board meeting begins at 8:15 a.m. Tuesday in Room 901 in City Hall. The agenda includes a proposed addition to the Jasper Parrish administration building at 520 Hertel Ave.
• The Council’s Finance Committee will meet at 10 a.m. Tuesday in Council Chambers. The city’s contract with ambulance provider Rural/Metro is on the agenda. • A meeting of the Council’s Community Development Committee begins at 1 p.m. Tuesday in Council Chambers, where lawmakers will discuss the proposed sale of the former School 71 building, at 104 Lang Ave., to King Center Charter School, currently located at 938 Genesee St.
• Public input on redeveloping brownfields will be sought during three open houses this week, each of which will be held from 6 to 8 p.m. The Buffalo River brownfield opportunity area will be discussed Tuesday in the Old First Ward Community Center, 62 Republic St. The Tonawanda Street Corridor is the subject Wednesday in the Riverside Institute of Technology, 51 Ontario St., and the Buffalo Harbor brownfield opportunity area will be discussed Thursday in the Herman Badillo Bilingual Academy, 315 Carolina St.
• A career fair will be held from 10 a.m. to noon Thursday in the Community Action Organization JFK Community Center, 114 Hickory St. Employers with job openings will attend the event, which is sponsored by CAO, and the Buffalo Employment and Training Center. • A meeting of the Buffalo Urban Renewal Agency begins at 9:30 a.m. Thursday in Room 209 of City Hall. • The Preservation Board meets at 3 p.m. Thursday in Room 901, and will consider a local landmark designation for the Meidenbauer-Morgan compound in the Fruit Belt. The buildings, one of which is a Civil War-era house, would be demolished under plans by St. John Baptist Church for a pharmacy and deli. • Project Slumlord will meet at 6:30 p.m. Thursday in the Lt. Col. Matt Urban Center, 1081 Broadway. The group is focused on reducing slum and blight in city neighborhoods. Housing Court Judge Patrick Carney and city building inspectors are expected to attend. To mark the annual observance, there will be a ribbon-cutting ceremony at 1:30 p.m. Tuesday to open new trails at Reinstein Woods Nature Preserve. Abby Snyder, regional director of the state Department of Environmental Conservation, which operates the preserve, also will announce a watchable wildlife mobile application. Entrance to the preserve is at 93 Honorine Drive. • A Town Board meeting begins at 6:45 p.m. Monday in Council Chambers in Town Hall, 3301 Broadway. • The town’s Sanitation Department grass trucks will hit the road this week. All grass clippings and yard debris should be in open-top containers or brown, biodegradable lawn/leaf bags. Bundles of branches are limited to 4 feet long, 4 inches in diameter and a maximum of 40 pounds. • A special meeting of the Cheektowaga-Sloan School Board begins at 7:30 a.m. Tuesday in the Irma Czubaj Board Room at Woodrow Wilson Elementary School, 166 Halstead Ave., Sloan. • The Maryvale School Board will vote on the BOCES budget and board elections at a special meeting at 8 a.m. Tuesday in the Samuel R. Bennett Administration Building, 1050 Maryvale Drive. • Votes on the BOCES budget and board also will be cast at Tuesday’s meeting of the Cheektowaga Central School Board, which begins at 7 p.m. in the board room of the high school, 3600 Union Road. • The Cleveland Hill School Board meets at 7 p.m. Wednesday in the community room at 105 Mapleview Road. • Ann Marie Linnabery, assistant director of the Niagara County Historical Society, will talk about the history of the Erie Canal at Thursday’s meeting of the Cheektowaga Historical Association, which begins at 7 p.m. in the Senior Center, 3349 Broadway. The meeting is free and open to the public. The Clarence Women’s Club’s 51st Annual Scholarship Card and Game Night is scheduled for May 6 in Clarence Town Park Clubhouse. Tickets are $5 per person and include door prizes, strawberry shortcake and beverages. A Chinese auction will be held. The money raised will allow the club to award five scholarships to Clarence High School seniors. The event begins at 6:30 p.m. on May 6 in the clubhouse, 10405 Main St. For more information, call 310-7674 or 741-4718. • A meeting of the Clarence School Board begins at 7:30 a.m. Tuesday in Conference Room B in the district office, 9625 Main St. The School Board will vote on the BOCES budget and board elections. • The Clarence Chamber of Commerce is holding an A.M. Networking event, beginning at 8 a.m. Wednesday, in Cozy Cafe & Catering, 9060 Main Street. Tom Shelberg of Picone Construction will speak. • The Planning Board convenes at 6:30 p.m. Wednesday for a work session in the Hallock Conference Room at Town Hall, One Town Place, followed by a regular meeting at 7:30 in the auditorium. The Depew School Board will meet at 6:30 p.m. Tuesday in the cafeteria at Depew High School, 5201 Transit Road. Kiwanis Club of Marilla is holding its annual town wide cleanup from 9 a.m. to noon Saturday. Volunteers should sign up between 8:45 and 9:15 a.m. in the Marilla Community Center, 1810 Two Rod Road. Trash bags, assignments and instructions will be given out at that time. Lunch will be served to all participants beginning at 11:30 a.m. in the Community Center. Call 652-7608 for more information. • A meeting of the Elma Conservation Board begins at 7 p.m. Tuesday in Town Hall, 1600 Bowen Road. A review of conservation land easements is on the agenda. • Elma’s Multiple Dwelling Code Committee will meet at 7 p.m. Wednesday in the Town Hall for further discussions about the Seneca Street area. • The Marilla Town Board is holding a work session at 7 p.m. Tuesday in the upper meeting room at Town Hall, 1720 Two Rod Road. • A meeting of the Marilla Sludge Committee begins at 7 p.m. Tuesday in the supervisor’s office at Town Hall. • The Marilla Historical Society is sponsoring a public program on genealogy at 7 p.m. Thursday in the Community Center, 1810 Two Rod Road. Call 652-1827 Monday to reserve a spot. • A work session of the Wales Town Board begins at 7 p.m. Tuesday in the Community Center, 12345 Big Tree Road. Highlighting the campaign is Open House Weekend, scheduled for this weekend. The Town Board will consider the site plan for Nottingham Estates, a three-building, 32-unit apartment complex on a two-acre property at 1995 Grand Island Blvd., when it meets at 8 p.m. Monday in Town Hall, 2255 Baseline Road. Site plan approval also is sought for an expansion at the KOA campground, 2570 Grand Island Blvd., to accommodate six more campsites, and for additional outside storage at 2389 Whitehaven Road. The board also will discuss the town code on tourist homes. No longer on the agenda is a public hearing on rezoning for the controversial 414-unit Light House Pointe residential project at Whitehaven and East River roads; it was canceled at the request of the developer. A board workshop begins at 6:30 p.m.
• The Grand Island Chamber of Commerce holds its 48th annual Citizen of the Year Award Dinner at 6 p.m. Thursday in Bylbos Niagara Resort, 100 Whitehaven Road. Tickets are available at the Chamber office, 2257 Grand Island Blvd. Call 773-3651. Honorees include Nonnie Carroll, Volunteer Service; Cheryl Chamberlain, Educator; Hizair Hair Salon, Business of the Year; Lynn Alan Konovitz, Professional Contributor; and Teddy Klingel Linenfelser, Service to the Community. • The committee for Relay For Life of Grand Island will decorate the Town Commons, adjacent to Town Hall, on Saturday to show support for those touched by cancer. Bows, which cost $1 and $5, can be purchased from 9 a.m. to 1 p.m. in the nearby First Niagara Bank branch, 2300 Grand Island Blvd. • The Knights of Columbus Good Samaritan Council is hosting a Taste of Italy Dinner on Saturday in the cafeteria of St. Stephen’s School, 2080 Baseline Road. It begins at 6 p.m. with a cash bar and complimentary appetizers, followed by a buffet-style dinner at 7. Dinners are $14 for adults, $12 for seniors and $9 for children ages 5 to 15. For reservations, call Joe Diebold at 773-1196 or e-mail jdiebold@verizon.net. Ten people will be recognized May 1 for their dedication to youth development and recreation at the Town of Hamburg’s 26th Youth Bureau Service Awards banquet. Barb Wagner will receive the Michael J. Dundon Service to Youth Award, given to the person who best exemplifies the service of the late Michael J. Dundon, a longtime executive director of the Youth Bureau. The Youth Bureau also will honor Midge Harrington, Walter Rooth III and Rick Szabala with the Service to Youth Award. Recipients are recognized for having given a high degree of their time, energy, dedication and commitment to youth development within the town. The Recreation Department will recognize Sean Muldowney, Keith Thurnherr, Ralph Colucci, Steve Chaffee and Chris Damiani as Character Coaches of the Year. The award recognizes qualities that include being a positive role model who leads by example, and demonstrates fairness and sportsmanship. Ryan Nurmi will receive the Donny Thiry Human Spirit Award, which honors the memory of its namesake, who loved sports but was prevented from active participation because of physical limitations resulting from neurofibromatosis. “Despite his physical limitations, he came to Hamburg Recreation when he was still finishing high school at Frontier. He worked the scores table at the basketball games and did whatever else was needed,” said Martin Denecke, director of the Youth, Recreation and Senior Department. That award goes to the person who best exemplifies the qualities that Donny displayed, overcoming all obstacles in his or her path and remaining positive and inspiring others. Outstanding members of Youth Engaged in Service also will also be recognized. To register for the banquet, contact Nicole Dayka at 826-2226, or visit the town website at www.townofhamburgny.com. • The Hamburg Village Board will conduct a work session at 5:30 p.m. Monday, followed by a regular meeting at 7, in Village Hall, 100 Main St.
• The Frontier School Board will meet at 5 p.m. Tuesday at Frontier Educational Center, 5120 Orchard Ave. The board plans to go into executive session and return to open session at 7 p.m. , when the board is expected to appoint a new superintendent and adopt the 2014-2015 budget. • A meeting of the Village of Hamburg’s Planning Commission begins at 7 p.m. Tuesday in Village Hall. The board plans to review a proposal for a senior citizen apartment project on Main Street. • The Hamburg School Board meets at 6 p.m. Tuesday in Union-Pleasant Elementary School, 150 Pleasant Ave. The board plans to go into executive session at 6 p.m. and return to regular session at 7:30. • A meeting of the Blasdell Village Board begins at 7 p.m. Wednesday in Village Hall, 121 Miriam Ave.
• “Building a Sustainable Business through Succession Planning,” a seminar presented by the Hamburg Chamber of Commerce and Hilbert College, begins at 8:30 a.m. Friday in the Armor Inn Saloon, 5381 Abbott Road. The event is open to the public, but reservations are required. Contact the chamber at 649-7917 or at its website at www.hamburg-chamber.org. Mayor Geoffrey M. Szymanski will take another step to fight blight Monday, when the city’s new instant ticketing program takes effect. Instant ticketing will allow code enforcement officers to issue on-the-spot fines for property code violations. City inspectors will be looking for code violations that include: hanging gutters, garbage totes put to the curb too early or yards strewn with litter, said Szymanski. The $25 fine will double if the violation is not corrected. • The inaugural Dyngus Day Parade will roll from Our Lady of Victory Basilica after Monday’s 12:10 p.m. Mass. The parade will travel to Lackawanna City Hall, 714 Ridge Road. • A meeting of the School Board of Global Concepts Charter School begins at 7 p.m. Wednesday in the school auditorium, 1001 Ridge Road. The Town Board meets at 7 p.m. Monday in the board room at Town Hall, 21 Central Ave.
• A meeting of the Lancaster School Board begins at 6:30 p.m. Tuesday, when an executive session will be held, in the Central Avenue Board Room, 149 Central Ave. The public session begins at 7. Councilman Michael Sherry is looking for volunteers for a Government Efficiencies Task Force to examine government operations and find ways to save money and time, and to improve services. Created at last week’s Town Board meeting, the task force will review, among other things, the police department’s budgeting process to see if it can be streamlined, Sherry said. The committee will have five to seven members and will start meeting once a few people have signed up. People with expertise in budgeting and business operations are invited to apply. Those interested in applying should call Town Hall at 662-6400 and leave a message for Sherry, or e-mail him at mikesherryop@orchardparkny.org. • A regular meeting of the Orchard Park School Board begins at 6:45 p.m. Tuesday in the district office, 2240 Southwestern Blvd. • The Town Board has a work session at 6 p.m. Wednesday in the board room of the Municipal Center, 4295 S. Buffalo St.
“Council on Your Corner” is coming to the City of Tonawanda. Fourth Ward Councilmember Jenna Koch and Third Ward Councilmember Jay Hall will host a town hall meeting at 5 p.m. April 30 in City Hall, 200 Niagara St.
“This is another opportunity outside of our council meetings for residents ... to come and ask questions, discuss ideas and have an informal conversation with your representatives,” Koch said. • The Tonawanda School Board will meet at 6:30 p.m. Tuesday in the high school, 600 Fletcher St. A budget for 2014-15 will be adopted. The Learning Disabilities Association of WNY is looking for volunteers to help with its Earth Day Community Clean Up Day. Volunteers will meet at 5 p.m. Tuesday at 2555 Elmwood Ave. Cleaning supplies will be provided, but participants are encouraged to bring their own gloves. Food and refreshments also will be provided. • The Town Board will hold a work session at 4 p.m. Monday in the conference room of the Municipal Building, 2919 Delaware Ave. A regular meeting follows at 7:30 in Council Chambers. • A Village of Kenmore Planning Board meeting begins at 6 p.m. Tuesday in Room 15 of the Municipal Building. • A second public meeting to discuss updates to the Town of Tonawanda Comprehensive Plan begins at 6:30 p.m. Tuesday in Milton J. Brounshidle Post 205, Veterans of Foreign Wars, 3354 Delaware Ave.
• The Kenmore-Town of Tonawanda School Board is holding a special meeting at 4:30 p.m. Wednesday in the board room of the Administration Building, 1500 Colvin Blvd., regarding the superintendent search. Parents and guardians of students entering sixth grade in West Middle School next year are invited to a tour and informational session Wednesday. The event, for adults only, begins at 6 p.m. with a building tour, followed by the informational meeting at 7 in the auditorium. Guests will hear from Principal Matthew Bystrak; Assistant Principal Andrew Klaich; Katie Kubiak and Ann Marie Canaple, who are school counselors; Linda Thibault and Deborah Hughson, school nurses; and Aimee Smart, the school’s social worker. • The Town Board meets at 7 p.m. Monday in Council Chambers at Town Hall, 1250 Union Road. • “Know Your Backyard,” a video focusing on the history of the town and the importance of the creeks and tributaries running through it, will be shown by the town’s Environmental Commission at 7 p.m. Monday in the Senior Citizens Center, 4620 Seneca St.
• The West Seneca School Board meets at 6:30 p.m. Tuesday in Room 200 at West Elementary School, 1397 Orchard Park Road. • A meeting of the town’s Zoning Board of Appeals begins at 7 p.m. Wednesday in Council Chambers at Town Hall. • A Family Health & Safety Fair will be held from 10 a.m. to 2 p.m. Saturday at the Senior Citizens Center. Myriad free health screenings and safety information will be available at the event, sponsored by state Sen. Patrick Gallivan, R-Elma. It coincides with the eighth National Prescription Drug Take-Back Day, when unwanted medications can be dropped off for disposal.